rose symbolism | Robert Mitchell Jr.
Archangel Barachiel (art by yours truly). His primary symbols are the rose and the lightning bolt. The following is an excerpt from Cabal Fang: Complete Study Course from Querent to Elder. If you like this, you’ll love the book. Depending on the Hebrew spelling, Barachiel translates as either ”Blessing of God” (Barachiel) or “Lightning of God” (Baraquiel). He doesn’t appear in the traditional biblical scriptures, only in the apocryphal books of Enoch. In 1 Enoch, he is Baraquiel, the “Lightning of God”, a fallen angel who is one of the 200 rebellious angels known as Watchers. But in 3 Enoch, where his name appears with both spellings used interchangeably, Barachiel is an angelic prince who rules over the second of the seven heavens. With this conflicting and confusing information in mind, views and interpretations of Barachiel vary widely. To a person of Orthodox or Catholic persuasion, Barachiel is an Archangel and a saint, the supreme leader of all the guardian angels. He is depicted in religious art as a radiant figure holding a white rose, a basket of bread, or a lightning bolt. 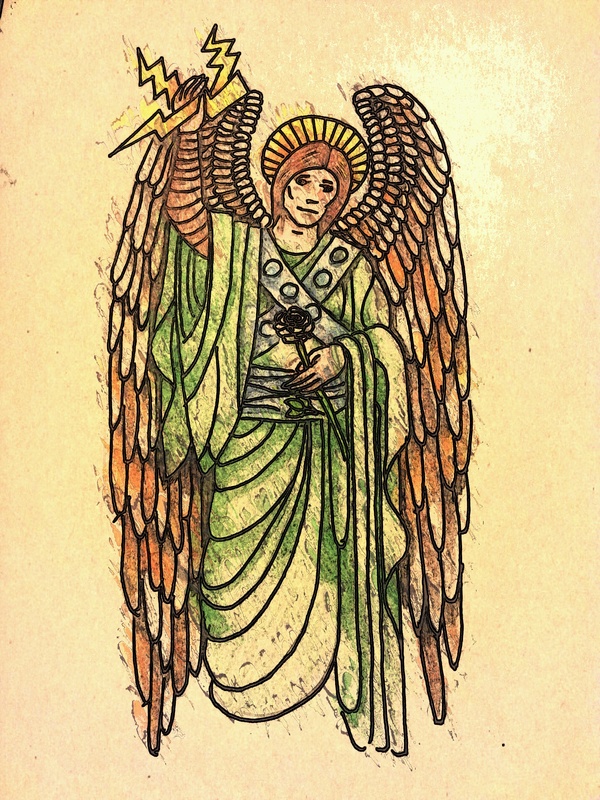 Believers in folk magic may see Barachiel as a spirit or saint who can be petitioned for help in matters of luck and games of chance, or to prevail in a contest. Barachiel’s symbols are the rose and the lighting bolt. Meditation on a Rose. Select a color of rose that reflects a mental state you want to cultivate (see list below if needed). Set a timer for at least five to ten minutes. Assume your meditative posture of choice, regulate your breathing, and then imagine a rosebud of the chosen color. As you meditate on the bud, imagine in your mind’s eye that the bud is slowly opening. As the bud opens into a blossom, so does your mental state open up and flower into the desired state.